This might actually be the best invention ever for homeless people and vegetarians. For vegetarians around the world..UNITE! 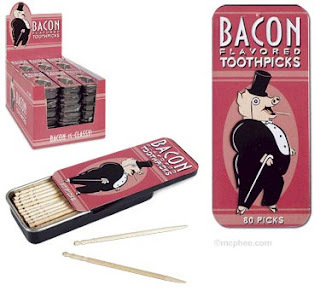 and get your bacon flavored toothpicks today! Savor the bacon taste you've been missing all this time. Get some protein in your diet NOW. For homeless people. You get 160 strips of bacon for $4.95. That's 160 meals for less than 5 bucks! Click pic to see how they're made! Beware!